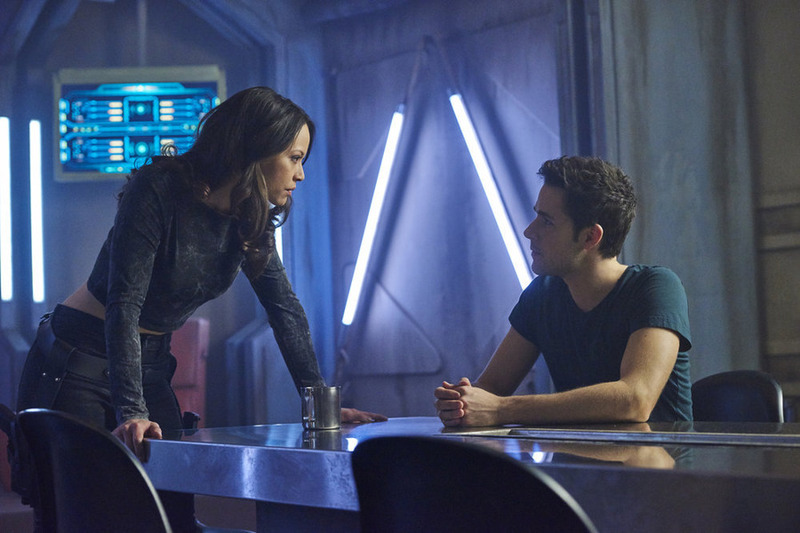 Here is part two of the press call with Dark Matter‘s executive producer Joe Mallozzi and stars Melissa O’Neil, Marc Bendavid, and Anthony Lemke to talk about what viewers can look forward to. Dark Matter airs Fridays at 10/9c on Syfy. Joe, you were talking about this being a ship-based drama. Can you talk a little bit about this ship and how it plays under the tone and feel of “Dark Matter”? Joseph Mallozzi: Yes. I think the ship is a reflection of the characters. We wanted – when designers designed the ship, we wanted something kind of badass…kind of smaller – I mean, I describe it as almost like a – like a – like a little gold box, just retrofitted with weaponry. She has a lot of experience, a lot of battle scarring, but it’s the type of ship that you kind of look at—and easy to underestimate—but, in battle, more maneuverable, a lot more savvy. The hero ship doesn’t get the upper hand on ships because of its size. The ship is a reflection of all our characters who – you don’t know very much about them on the surface but, as you dig deeper, there is a richness there and aspect that will surprise. Are you planning one complete arc for this first season or are we going to get a SG-1 style cliffhanger while we keep our fingers crossed for a second season? Joseph Mallozzi: I approach each season as a book in a series. So, the definite beginning, middle and end, like a season-long arc, is not to say it’s not going to end in necessarily a cliffhanger but very early on, we have some questions that get established very early versus about the mind wise, and what’s going on. As the season progresses, we begin to peel the onion on these various characters and their back stories and who they are and, essentially, the mixed views of how they ended up on that ship and what happened to them. One of the things that I promised fans is we are not going to be the type of show that is going to ask a lot of questions and then leave then unanswered. We are going to ask a lot of questions, we’re going to keep asking a lot of questions, but we will pay them off along the way and in the most satisfactory fashion. Anthony Lemke: I was going to jump in here as well if I can, just really quickly because one of the things I noticed from – as an outsider is reflective – was that – often, you see ship-based shows and they’re being driven kind of like – kind of we drive our own cars today by the folks involved. And it’s not always the case. But, we have our interaction with the ship can be very manual in that way. But, it also goes through the android character. In a way, as an actor looking at what the ship is, the android was a real sort of interface with the ship for us for a lot of reasons. And, so, the ship, in a way, almost has its own character as well through the character of the android, which is an add-on to the ship but is definitely integral in the ship’s – in the ship’s system. So, to me, that’s just a neat little point that Joe brought in there. Would you say “Dark Matter” aligns more with the tone of “Stargate Universe” than the previous “Stargates”? Joseph Mallozzi: I want to say, basically, it falls somewhere in between because one of the things that “Universe” did so well is it dealt with kind of the bigger issues. In our series, there is a bigger issue of, for instance, redemption: are people born bad? In that respect, it’s a lot like “Universe” in terms of tone and in terms of look. And yet, one of the things that I know a lot of fans were missing on “Universe” was that sense of humor that really marked “Atlantis” and “SG-1.” It’s one of the biggest, I think, characteristics of this show, “Dark Matter.” Its sense of humor. I keep on emphasizing fun. “Atlantis” was fun. “SG-1” was fun. Maybe some fans did not consider “Universe” fun because it was a little dark. It was a little slow to get going more introspect, a little claustrophobic, which basically “Dark Matter” is not. So, “Dark Matter” is fun. 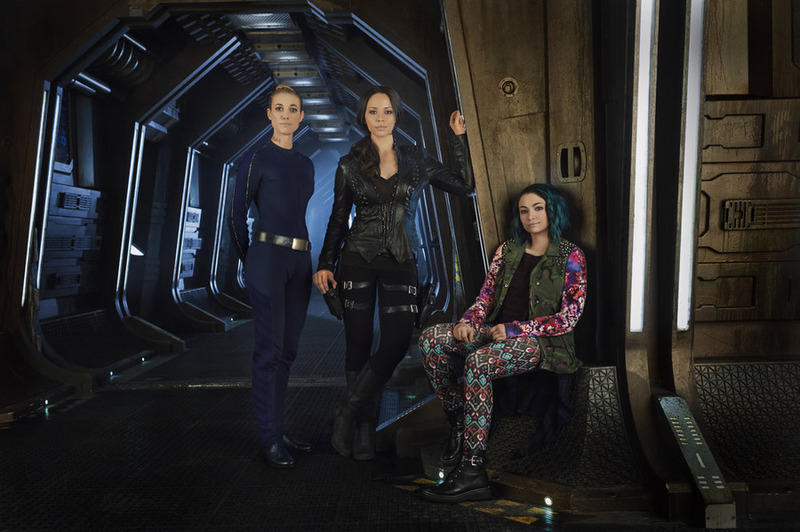 For “Stargate” fans, if you love “Atlantis” and “SG-1,” I think you’re going to love “Dark Matter.” And, frankly, if you love “Universe,” you’re going to love “Dark Matter.” It’s the very best of all three shows. How are the relationships between the characters? Melissa O’Neil: I had – I had a great talk with Paul, our other writer and executive producer, about this. He was talking about how when they were developing – or Joe – like this type of moment – that a lot of sci-fi shows in that past have talked about how humans were – it was a bit utopian society – everyone was getting along – and that they wanted to bring back this idea that the conflict isn’t going to come from external sources. It’s going to come from within each other as we’re fighting for resources, we’re fighting to stay alive when we are not on the planet anymore. We are in space. I think that that’s – it’s so honest and great and real. It allows us to be humans because we’re not always going to get along because we don’t in life. Trying to navigate that when you’re dark essentially on this, you know, life preserver in the middle of space, our beloved ship, how do you – how do you figure out how to co-exist with these essentially – six other strangers? It’s wonderful. Marc Bendavid:	Well, the interesting thing, from the standpoint of getting along, that there’s so many reasons presented so fast for us not to trust each other. But, this encounter with our eventual – I don’t want to give too much away – with the android is that, you saw, it didn’t turn out well. We find out things at the end of the episode that would suggest that we’re maybe not going to be compatible. And, at the same time, it becomes clear that with all the people who are after us, the only way we stand even a slim chance of survival is getting along. And, so, it’s constant play which continues throughout the season between who is this person and what do I need to know about them to trust them and can I trust them less or not and can I – and that question gets asked in life or death situations all the way – all the way to episode 13. And I – and I think we learned that that kind of negotiation – it’s not important to get along if you can trust – if you can trust one another and maybe go out – go out getting along the other way – go out of it backward, inside-out, shoot first and ask questions later. Joe, you mentioned that you had – you had an open gender casting. Since the characters already existed in the comic book, why did you decide to make the changes that you did? Joseph Mallozzi: Just one of the best actors for role at the end of the day and, also, to redress what I felt was a bit of a gender imbalance in the comic book. I mean, you know, like I said, we opened this to all genders and all ethnicities, specifically the roles of Four, the sword-wielding Four and the android. We got some fantastic– a thousand possibilities, both male and female for both. But, ultimately, I think we found the right actors for the role and in the comic book character, Four is male. It’s somewhat different from Alex Mallari Jr. who just nailed the part with an audition that was so controlled and nefarious that, it just sort of blew me away. And, then, Zoie Palmer, who is playing a character so unlike you know her character in “Lost Girl,” she came in and I talked about her where she came in and we were discussing the fact that one of the actors that came in, he was British and so he gave the android with a – with a British accent. And I’d say, the way I describe the android is less sort of like a – really a robot and more of that polished efficiency. Zoie was like, “I can – I can do a British accent.” And so, she did one version with a British accent. And she was like, “I can also do a Jamaican accent.” And I was like, “Do it.” And she does Jamaican accent. That was like, “Aha, this is interesting.” So, file that Jamaican-accent story away and we’ll talk about it later on in the season. But she brings something just so great to the character. I mean, there is – people come to – there’s certain expectations one has with the android character and her character answered those expectations and yet she brings a certain earnestness and childlike wonder and joy to the performance that I think will make her an instant fan favorite. Melissa, this is your first television role. What drew you to “Dark Matter”? Melissa O’Neil: Oh my god. Yes. I say oh my god because I feel – it’s funny because after having done – been in her shoes for – well, I don’t know – four or five months, the line gets a little bit blurry because you are just trying to respond naturally. She is just – she is smart and she is compassionate and she is so firm about her thoughts and her decisions. She doesn’t waver much, and I respect that. Beyond that, when I’m looking at the decisions that she is making, I agree with them for the most part as myself. So, I don’t feel like it’s too much of a leap other than she rocks a furrowed bow quite often. But, the credit goes to my agent. He definitely was the one who saw the casting notice and he sent it out to me and pushed me to audition and get myself out of New York to come back for this and for that, I am forever grateful. It’s a wonderful, wonderful part and I’m absolutely honored that I get to be in her shoes.